The latest NEC election results will see Rhea Wolfson, who stepped down to stand as a parliamentary candidate in Livingston, Christine Shawcroft, who had already decided to stand down before resigning from the ruling body in March, and Ann Black, who was dropped from the Corbynite slates following rows over her voting record, replaced by new first-time members Huda Elmi, Nav Mishra and Ann Henderson. 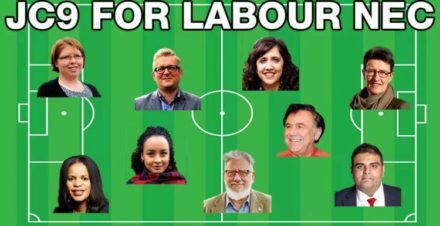 The six other successful candidates – Claudia Webbe, Jon Lansman, Rachel Garnham, Yasmine Dar, Peter Willsman, Darren Williams – are incumbent NEC members. What does the election of these nine CLP representatives on Labour’s NEC mean for the party? 1) Corbynite control of Labour Party structures will be stronger than ever. Left-wing pressure groups Momentum, Campaign for Labour Party Democracy (CLPD) and Centre-Left Grassroots Alliance (CLGA) stopped endorsing Ann Black’s NEC candidacy after the 2016 leadership election. They claim the independent-minded Labour left veteran had started to vote with Corbynsceptics on the NEC. Black strongly denies accusations that she backed the six-month freeze date on members voting and oversaw the suspension of Brighton, Hove & District Labour Party, pointing out that the Brighton suspension was the responsibility of the governance and legal unit and that she voted for Jeremy Corbyn to automatically have a place on the ballot paper. Nonetheless, many Corbynites are convinced that she switched loyalties at worst and was an unreliable voter at best, and will be reassured by Black’s failure to win a seat. 2) Labour members aren’t ‘more Chris Williamson than John McDonnell’. That is what has been suggested on Twitter (prior to the results being announced). But such a conclusion: a) likely overestimates party members’ awareness of the Willsman scandal and Momentum’s decision to drop their support; b) assumes that few votes were cast before the recording was leaked, although ballots dropped several days before Momentum withdrew their endorsement; c) ignores that Ann Black, a self-described supporter of Corbyn, won fewer votes than three Corbynsceptics. 3) It could spell trouble for the future of IHRA. At a crunch meeting today, Labour’s NEC is expected to strengthen its code of conduct in line with the International Holocaust Remembrance Alliance definition of antisemitism. It is likely, although not absolutely certain, that caveats will be added to assuage fears that IHRA alone would restrict freedom of speech on Israel. The new NEC cohort aren’t taking up their places until after conference, so any impact will be felt in the code of conduct’s application rather than its formulation. The nine new members will populate the disputes panel that deals with disciplinary cases and membership appeals. That includes Peter Willsman, who said he’d never seen antisemitism in the Labour Party just two weeks after sitting through a disputes meeting where the majority of cases concerned antisemitism. Crucially, the NEC is an interpretive body and its members can interpret the revised antisemitism guidelines however they so choose. 4) Momentum’s process for selecting its slate will be reformed. Momentum activists, particularly those who are more aligned with Jon Lansman (sometimes referred to as the right of Momentum, no kidding), believe that Willsman would not have got onto their NEC slate had the process been more democratic. Currently members of Momentum’s national coordinating group (NCG) vote on which candidates to endorse, but the latest results will fuel the drive for a more directly member-led procedure. Whether Momentum figures are right to suspect that active members of the campaign group (those more likely to engage with internal votes) would have been more likely to back Willsman than the NCG is another matter. 5) Not every member of the Labour Party is a political obsessive. Eddie Izzard won 67,819 votes – only 2,502 fewer than Willsman – and he was followed by Johanna Baxter, Gurinder Singh Josan, then Ann Black. It was widely expected that Black would come ninth, scraping a win, or tenth, narrowly missing out. (One optimistic campaigner even suggested she could top the ballot, as she did in 2016, thanks to a rainbow coalition of ‘soft’ Corbynites, the soft left more broadly and avowed Corbynsceptics.) That it was in fact Izzard who challenged Willsman shows name recognition matters, and apparently – even amongst the few Labour members who vote in internal elections – being a famous comedian carries greater weight than years of building relations with CLP secretaries and writing detailed NEC reports. 6) Turnout doesn’t seem to have increased. This is related to point 5. In 2016, winners won between 100,999 and 81,863 votes. In 2018, the successful candidates won between 88,176 and 70,321 votes. Membership has increased only by about 20,000 members over the last two years, but turnout appears to have dropped slightly. That would suggest the fear amongst members of losing a Corbynite majority on the ruling body has flatlined or dipped.